Following a busy 2015 season its now time to prepare for 2016. For much of the golf industry those preparations start with a trip to Harrogate for the GOLF TRADE SHOW. A great opportunity for retailers and suppliers to get together and discuss the season past and plan for a great 2016. With that in mind I thought I should provide an up to date market overview with some perspectives of how 2015 has gone and what we can expect for 2016. The good news is that after a couple of years of decline the overall market is up. 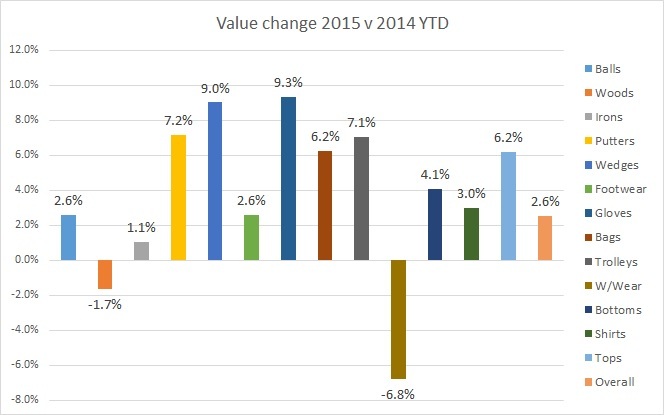 According to the GOLF DATATECH retail audit the year to date figure to the end of August 2015 is up 2.6% in value. Growth hasn’t been seen across the board. On course retailers are up 5.2% in value and have faired better that the off course retailers who are down 1% for the same period. Across the key product groups tracked in the retail audit there is quite a variance in performance. 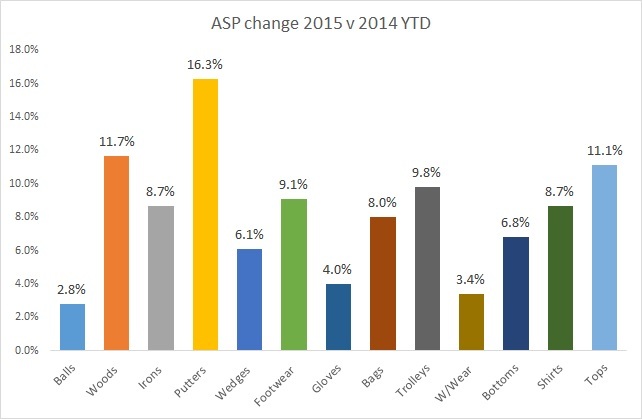 Top performers – Gloves and Putters are both up 9%+. While others have not faired so well – woods down 1.7% and weather wear down 6.8%. The news is not all good. Units have been hit in nearly all categories. Balls are flat, gloves and wedges are up but everything else is down. Logic would say that good unit sales in consumables (gloves and balls) would indicate that participation has been healthy. People have been playing golf – so why have sales of other items been hit? Well higher asp’s may have had an impact, so to longer replacement cycles. Golfers were changing their woods every 3.5 years but as many are now custom fit this cycle may be elongating. Footwear and apparel have had good years recently so perhaps it is no surprise there is a bit of a slow down in those sectors. The worry about reduced unit sales is the effect on residual stock. Excess stock has been an issue for many years with on course stock turn having been as low as 2 in recent times. Apparel has been badly hit with stock turn being very low at less than 2. As units have been down on projections then retailers will likely have more stock in store than they planned for. They must factor this in to next seasons plan. ASP’s must be up – right? Yes they are! ASP’s are up right across the board and this has hidden the poor unit performance of many of the categories. There’s a variety of reasons for the rise in ASP, increased costs and higher exchange rates have had an effect. There also appears to be a shift to higher priced product. If you look at drivers, the average price of the top 3 selling drivers in 2014 was £238 and they accounted for 29% of units. In 2015 the top 3’s average price was £257 and they accounted for 37% of unit sales. That’s a big shift and good news for retailers if they can generate the cash margin. 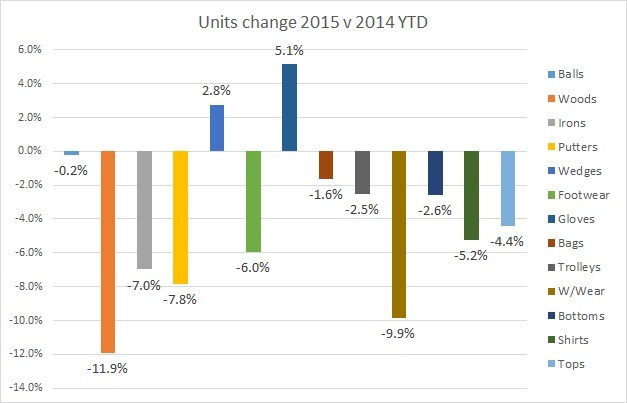 However the higher price points may be putting off consumers with woods seeing a fall of nearly 12% in units. By comparison, one of the other big looser’s in unit terms was putters, up 16.3% in ASP but seeing a 7.8% reduction in unit sales. Has one lead to the other? As part of the stocking plan retailers must keep an eye on total stock holdings. Many should be looking to reduce their stock levels, some by as much as 30%. When it comes to reordering, brands that can provide a margin, decent sell through and minimum commitments should be on the top of the list. When in discussions, please don’t get tempted by some of the stretch targets on offer. If last year you sold 10 items and only plan to sell 10 this year – don’t be fooled in to buying 12 for an extra 5% off – it wont pay off. You could be left with 2 items you then have to clear out that will ultimately consume much of the total margin made. Where will they go? Well retailers should be mindful of next years sporting distractions. The Olympic games and European Football Championships are all set to pull golfers away from the course! Looking back at London 2012 it had a significant impact on sales. While Rio will have less of an effect due to the timing and location of the events, retailers would be wise to factor the games in to their plans. To make matters worse this is also a football year with the European Championships being held in France in June and July. This cuts right in to the heart of the season and will have an effect on sales. In previous years we have seen an average reduction of 5% across June and Julys figures across most product categories. There is no reason to think this won’t happen again this year. So unless you have something significant happening at your club, I would plan for a flat year. Its never easy planning ahead but if you are well prepared with good numbers you will have a better chance than most. Good Luck, and if you get a chance pop by and see us on stand – C20.